What Does it Really Take to Bring a Warren Miller Film Segment to Life? WARREN MILLER DIRECTOR MAX BERVY is limping around the fabled Warren Miller Films closet. This heavily guarded armorer’s stash is a goldmine of gear and garb that will appear in the upcoming film. Max hobbles between shelves piled with newer-than-brand-new equipment that ski shops haven’t even seen yet. Having abandoned his crutches at the door, he steadies himself on a department-store rack stuffed with ski jackets and pants. A hooded snowboard jacket hangs open to reveal SAMPLE stamped in large purple letters on the liner. When he spots me, he gives me a pained smile that engages sun-baked laugh lines around his eyes. “Waterskiing. So much for my Summer.” We both frown. On the way back to Max’s office, I bring up a cheerier subject. “What goes into a great Warren Miller segment?” I ask. I’m in search of the elusive thing that has made Warren Miller fans so fiercely loyal for 57 years. “Four elements: light, snow, cameras, skiers,” Max tells me. “Just those, huh?” I ask with a grin. Max explains that without proper light during filming, the image just doesn’t do the sport justice, especially when projected on huge HD screens. You know how frustrating low-visibility days on the hill can be? When snow and spray and sky all appear the same shadowy white, it’s tough enough to see each mogul, much less film-worthy turns. Hollywood film sets are littered with high-powered lights and concert headliners face blinding spotlights, but Warren Miller crews travel with none of this. It’s up to the sun and forgiving clouds to light every segment just right. Sounds good on paper, but Mother Nature isn’t always so cooperative. When you’ve splurged on airfares, travel expenses, athletes, film-crew day rates, gear, film stock, and all the time to set up a first descent in, say, New Zealand, a relentless six-day blizzard is no excuse to come back empty handed. In 2000 that’s exactly what happened while filming Ride. The crew had so much footage of playing cards and cooking ramen in the half-buried hut on 10,000-foot Mount Aspiring that the segment was looking better suited to the Bachelor’s Cooking Channel than the next Warren Miller flick. Finally, on the last possible day for shooting, the clouds broke. With just minutes to limber up, the crew and athletes had a few hours to get seven days worth of shooting. And they did. So, yeah, you need good light. But without patience, foolish optimism, and a whole lot of ramen, there would never be a Warren Miller film. Seth Morrison once called snow a sort of painter’s canvas. Like kids with crayons, skiers can’t wait to leave their mark on all that pure white. And when it’s kids like Seth who are drawing, we can’t wait to see. But who likes to draw in a used coloring book? Film crews aren’t the only ones racing for first tracks. And then there are hot days that melt the fresh stuff before cold nights turn it to frozen chickenheads. 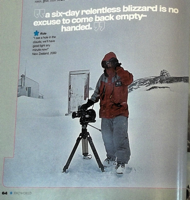 Max can spend hours listing the nightmare snow conditions he’s had to contend with in his 17 years on the film. The snow is as much a star of Warren Miller films as the athletes—and neither of them have makeup artists. 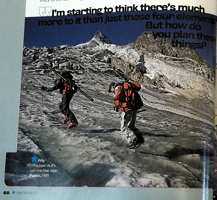 So to get the freshest snow, athletes may have to hike over frozen mud fields, ski the most remote parts of the mountains (rarely with the luxury of helicopters or snow machines), or simply do the best they can on a few inches of crud over rocks. How many skis and boards did the Courcheval crew wreck on the rocks in 2005 for Higher Ground? Four (all of them). Ask veteran Warren Miller athlete Chris Anthony how thick that gorgeous snowfield was in Dizin, Iran (2001: Cold Fusion). Three inches. And how many U.S. dollars did it take to rent a salvaged Russian military chopper to find freshies on that same trip? One hundred. And when you don’t have three inches, backup skis, or a rusted-out surplus heli? Make do. Shoot establishing shots. Do the snow dance. Time-lapse shots of those menacing clouds, local flavor, athlete antics—it takes more than patience to make the most of bad snow; it takes creativity. In Africa, after days of hiking and climbing 17,000-foot Mount Kenya, the glacier turned out to have enough passable snow for about five turns. 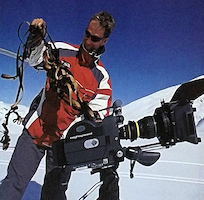 Watch the finished segment (from Cold Fusion, 2001), and you realize that it works because of masterful editing, a relentless cameraman (Chris Patterson), and athletes (Kristen Lignell and Justine Van Houte) willing to crisscross crevasses and seracs to get just enough footage. That’s improv. That’s hard work. If all it took to capture the action was a camera, then every weekend warrior with a camcorder would be another Warren Miller. For 57 years, Warren Miller’s crews have been packing the right gear and the right gang with the right training. They use real film rather than video. (Video, despite major recent advances, still can’t capture the high-speed action and snow’s difficult lighting contrasts in a lightweight package.) They make their own custom riggings for tracking shots and those vertigo-inducing mid-air shots. Nowadays they shoot with Arri SR2HS cameras and Super 16mm film for realistic detail and better latitude in subpar light. The camera crews cover all the terrain the athletes do—while packing 40 pounds of gear on their backs. “The cameramen are the key,” Max says, “They have to juggle so many variables everyday in the field.” I can’t help thinking of the film crew that got all the way to Kazakhstan before realizing the film was sitting back at the office in Boulder. 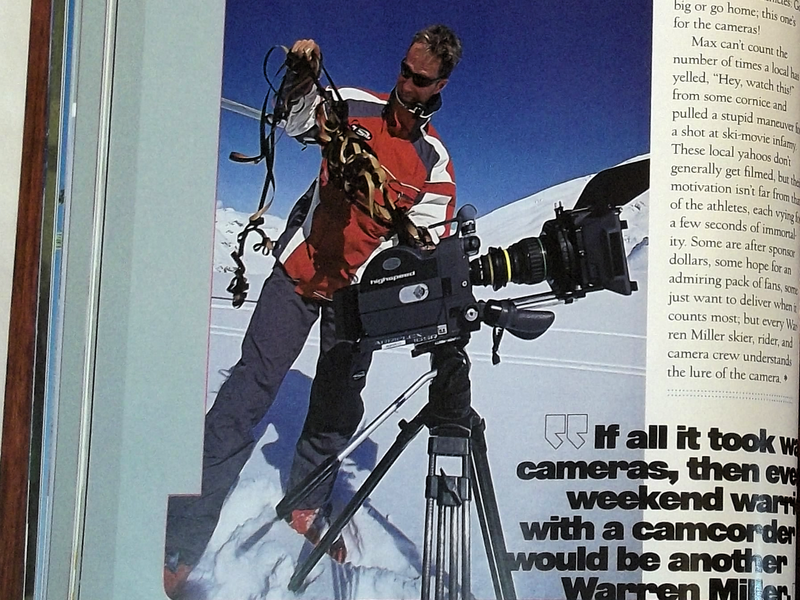 One humiliated long-distance phone call and an astronomical express-courier bill later, they were on their way to making one of the all-time great Warren Miller segments (for Snowriders 2, 1997), just a few days later than planned. When the cameras are rolling, every action and antic has a chance of becoming a memory shared by hundreds of thousands of people. That’s the lure of celluloid: It’s not simply that the cameras are there to capture what happens; it’s that great things seek out the lens. It’s as if a little horned demon tells the athletes: Go big or go home; this one’s for the cameras! Max can’t count the number of times a local has yelled, “Hey, watch this!” from some cornice and pulled a stupid maneuver for a shot at ski-movie infamy. These local yahoos don’t generally get filmed, but their motivation isn’t far from that of the athletes, each vying for a few seconds of immortality. Some are after sponsor dollars, some hope for an admiring pack of fans, some just want to deliver when it counts most; but every Warren Miller skier, rider, and camera crew understands the lure of the camera. The lure of celluloid has attracted a virtual ski and snowboard hall-of-fame to Warren Miller films through the years: Jean-Claude Killy, Stein Eriksen, Scot Schmidt, Glen Plake, Donna Weinbrecht, Craig Kelly, Seth Morrison. Just about anyone who ever did anything brilliant on snow has been in a Warren Miller flick. But it’s not about their names; it’s about what they did for the cameras—and even then, it’s not always about going big. Jim McKinnon won audiences around the country in 1996 (Snowriders) for his homemade backyard ropetow, blue jean ski fashions, and lopsided spread-eagle off an eight-inch jump. The Schrab brothers similarly built their own snowmobile tow-in gap jump, hucking legitimate world-class inverts on their grandparents’ Wisconsin farm (in 1999’s Fifty). Max tells me about this year’s biggest stunt: Jamie Pierre’s jump off a 245-foot cliff. After all the planning (no less than seven years), tests, preparations, and liability releases, it was still gonna take one huge sack of guts to huck off that edge. Max cues up the scene and rolls an early edit. Now that’s heart and guts and a complete disregard for everything else we were ever taught. 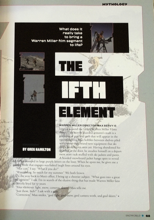 How is it that Jim McKinnon and Jamie Pierre can both be standout Warren Miller personalities? Ah yes, personality. Max is beginning to fidget; I can see that his phone’s red voicemail light has caught his attention. “Are you going to tell me?” he asks. He picks up the phone. Someone is calling with an idea for a segment that no doubt promises all four elements. But what about that elusive fifth element? If you can name it, capture it, or—most important—deliver it on film, well then, perhaps you ought to call Max.